Pogány-havas Regional Association (www.poganyhavas.ro) is a regional development organisation founded in 1999 by Hargita County Council and the local councils of six municipalities as well as local NGOs and entrepreneurs. It works on a range of projects to increase local incomes, preserve the region's cultural heritage, develop tourism and conserve the natural environment. The Pogány-havas area is in the Eastern Carpathians of Transylvania, in Central Romania. It consists of two major landscapes: part of the open mountain basin of Csík and the wild and mountainous Gyimes. Traditional farming created a beautiful and extremely biodiverse landscape throughout centuries, which is now threatened by modernisation. Our mountain hay meadows belong to the most biodiverse habitats of Europe (in 3rd place comparing 4x4 m botanical quadrats) however they are now threatened by abandonment and sheep grazing. The traditional ecological knowledge of Gyimes people distinguishes the highest number of habitat types in the local language all over the world. Our organisation’s main challenge is to harmonize the intensification of farming, the increasing income expectations of local people and the traditional and labour intensive farming methods favourable for nature. One of our success stories so far is that we doubled the milk price by persuading local farmers to set up milk collection points to sell their milk under new EU hygiene rules and world market pressure. 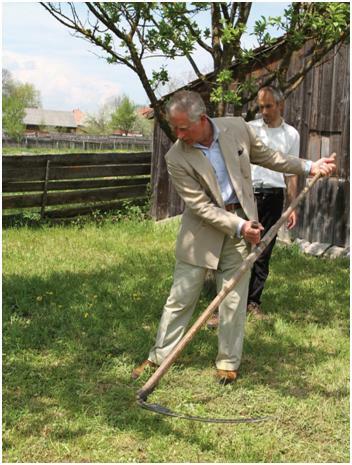 Our work raised international interest and Pogány-havas was visited by Prince Charles in 2011 and inspired a 20 pages article in National Geographic Magazine (July 2013). Of all countries in the EU, Romania has the highest proportion of the population engaged in agriculture, whilst average farm sizes are the smallest. Romania has 29% of the EU’s agricultural holdings, it has 20% of Europe’s agricultural workers, however only 8% of the agricultural area. (2010.) The majority of farmers in Romania produce in a subsistence (no income) or semi-subsistence way. This farming system maintains a very rich and several hundred year old Socio-Ecological Production Landscape. Probably this is one of the last places demonstrating living medieval European farming systems. The landscape itself is also considered to be one of the last medieval large scale landscapes of Europe. The immense contradiction of the survival of these landscapes is how a low intensity farming system can be sustained with a low willingness of farmers continuing a subsistence/semi-subsistence lifestyle. Our local development organisation is committed to help local communities to maintain this cultural and natural richness which survived here. The mission of the Pogány-havas Association is “to improve the quality of life of locals by respecting natural values and traditions”. Our vision is that the people in the region receive more income thanks to actions based on local resources and traditions. We wish to become a model region where vital rural communities live in harmony with nature and tourists visit us to experience this kind of lifestyle. Let’s look at first what are the natural treasures of our area, then we will introduce you to some of our projects which support the maintenance of our Socio-Ecological Production Landscapes. Csík is a mountain basin characterised by a wide, open landscape encircled by mountains, while Gyimes is a mountain area with deep and narrow valleys. The two distinctive geographies lead to different traditional agricultural techniques and also host two Hungarian cultural minorities, the Székely in Csík and the Csángó in Gyimes.The two landscapes share common features too, such as large forest areas scattered with widespread meadows and pastures. Local traditional agriculture based on cattle farming maintains productive meadows extremely rich in wild flowers. The higher altitude hay meadows in particular have an outstanding richness of plant species. Separating the two regions is one of the most important passes in the East Carpathian Mountains: the Gyimes Pass. With wonderful panoramic views, it connects the Carpathian Basin and the Transcarpathian Regions, and lies on the Carpathian watershed. Each village in Csík has large common forest and pasture areas managed on behalf of its members by an elected management organisation, the közbirtokosság (compossesoratus), with medieval origins. For historical reasons this system doesn’t exist in Gyimes. One becomes a közbirtokosság member by birth or marriage only, which offers some protection of the land from foreign ownership. Among the many treasures of our region, the most spectacular, precious, vulnerable and internationally important may be the mountain hay meadows. Centuries of traditional farming created these beautiful places, which are now threatened by abandonment and grazing by sheep. Hay making is still a family occupation here. Between May and September you can see mowers with scythes or small machines, children helping to turn the grass, heaps of hay pulled down steep slopes on sledges made of branches, and loaded horse-carts bringing their burden to barns for feeding livestock in the long winter months. A group of butterfly experts found in 2011 that the number of butterfly species on one meadow here is as much as in the whole of United Kingdom. The general sociological context of our work is the co-existence of pre-industrial, industrial and post-industrial values in three following generations. It creates a very unique and fragile situation for both: local culture and nature. Old people (above 70) grew up in a pre-industrial countryside and inherited medieval lifestyle with its values and they gave these to the next generation. Middle age people (40-60) during the communist times were forced by violence to give their land and agricultural assets to the cooperative which they had to join as well. This made many of them to leave the countryside and get an industrial job and was combined with the brainwash of communist propaganda. The young generation (up to 30) grew up after the fall of communism in 1990, when they could travel and many of them worked/work abroad. They are the TV generation, from their young age they learn about various non-local values and lifestyles. They have a wider view of the world and openness for more post-industrial values, whereas most of them kept something from the traditions and still have a strong connection to the locality as well. They have an increasing awareness of the uniqueness of their cultural and natural treasures which survived here for many centuries. They start understanding words like biodiversity, ecosystem services, quality of life (in contrast with standard of living), etc. This also translates into the landscape. There is a) a very diverse mosaic landscape of small arable parcels, big pastures, meadows and forests on the hillsides and hilltops still managed in a rather traditional way, 2) there is land concentration and an intensification of arable production in the mountain basin and 3) there is an unsustainably intensive deforestation process happening since the political change in 1990 with a strong support from the highest political levels. do nature conservation related projects including research which supports policy development as well as awareness raising actions. To reach these goals we organized a very wide range of different activities during the last 8 years between 2006 and 2014. With four staff, volunteers and partners, our small NGO is proud of the breadth and international reach of our activities. In the following we list up the most significant ones. We are working with scientists and NGOs to catalogue and conserve the special animal and plant life of the region, especially in its wetlands and hay meadows. We do social research on small scale family farming in the area to collect scientific evidence, to learn about their needs and based on this to formulate policy recommendations which benefit farmers, as well as nature maintained by them. We support traditional agriculture and boost farm incomes through training programmes, study tours and preparing grant applications for farmers, encouraging development of new dairy products, providing information about ecological farming, and helping farmers’ associations to increase the quality of their milk through ownership of milk collection and quality testing equipment. We encourage tourism in the region by offering a booking and information service, working with guesthouse owners, producing tourist information, and organising a tourism round-table for local entrepreneurs. We co-organize the annual Gyimes hay making festival, which has inspired two new British festivals. We founded the Csík-Gyimes Naturpark, to run nature and architecture protection projects and to prepare and promote the area as an eco-tourism destination. We organise training and field activities for farmers, scientists, NGO leaders or nature conservationists who come to study our area. We have produced an inventory of the most important examples of traditional village houses, and help to preserve the “village view” by encouraging people to restore their old houses, and through architecture competitions to design modern homes that incorporate traditional design elements and materials. We involve young people in our “lifeschool programme” – which is an opportunity to learn new skills, get involved in community and environmental protection projects, and take part in study tours abroad. We have published tourist guides to the region in English, a set of seven pocket guides to the cultural treasures of the region in Hungarian, a booklet about local food and drink products and producers and more. We produced information panels about local sites of interest and a village map for nine villages. We prepared study trails in two villages to present the cultural and natural treasures of the area. We organise study tours for the mayors, farmers, member organisations, tourism operators and young entrepreneurs to learn from the experience of other countries in our fields of activity. We prepared the LEADER rural development strategy (the EU’s rural development programme) and now we help writing LEADER grant applications for people and organisations from our area. We organise scientific conferences as well as lobby events in our area and in Brussels to teach other people about the importance of environmentally friendly small scale family farming and the effects of policy decisions on them. We are volunteering to support local children’s homes with goods and we organise every Christmas a gift box for around 90 children based on their wishes in their letters to the “Angel”. We increased the milk price in two steps: first by setting up the milk collection points and selling the collected milk to the processing companies we reached a price increase of 70%. The next step was to install milk vending machines, which increased the price by another 50%. We wrote 84 grant applications for our smallholders and through the successful ones (over 90%) about 550 thousand Euros arrived in the region. both authors’ visits were hosted by us. Publication of our film in October 2012 on traditional hay meadow management and culture – copies available from Barbara. New publication December 2011: Mountain hay meadows: hotspots of biodiversity and traditional culture. His Royal Highness the Prince of Wales visited our projects on 18 May 2011. The visit included a walk to an area of seasonal ponds which are the focus of our wetlands research, and the opportunity to meet people involved in our rural development, local food, biology, education and community development projects. Our project “Mountain hay meadows: hotspots of biodiversity and traditional culture” was awarded the 2010 prize from the Gesellschaft für Ökologie – the Ecological Society of Germany, Austria and Switzerland – for “an outstanding project in applied ecology”. Report based on a multi-faceted social research project carried out by the Pogány-havas Association in 2011. The main aim was to gain a comprehensive and evidence based picture about the family-farming system of the area, the farmers’ main concerns, problems and future plans, which provides data to work out proper interventions on local, regional, national and EU level. This study was also a reference for developing proposals to national and EU policy makers. of studies increased world-wide in the last decade, this knowledge is still rarely studied in Europe. We document the habitat vocabulary used by Csángó people, and determine features they used to name and describe these categories. In this paper I provide a context and background for this publication, and consider issues of national and European policy that affect meadow ecosystems in Romania. I describe the benefits for Romania of allowing as many as possible of its small-scale farmers to continue managing the land in an environmentally sustainable manner through traditional methods which create and maintain a mosaic landscape that is highly beneficial to biodiversity. In addition to the many ecosystem services provided by traditional extensive agriculture, these farmers provide food, social stability and meaningful work for their families and communities. The state cannot afford to pay for these free goods and services provided by semi subsistence farmers. The current reformulation of the Common Agricultural Policy provides an opportunity for change. Policymakers should re-examine what they mean by efficiency in agriculture, and include environmental and social costs and benefits on the balance sheet alongside the economic ones. Much more could be done by local, national and European government to ensure that the smallholders of Romania can have an economically sustainable future while maintaining their socially, culturally and environmentally valuable way of life. 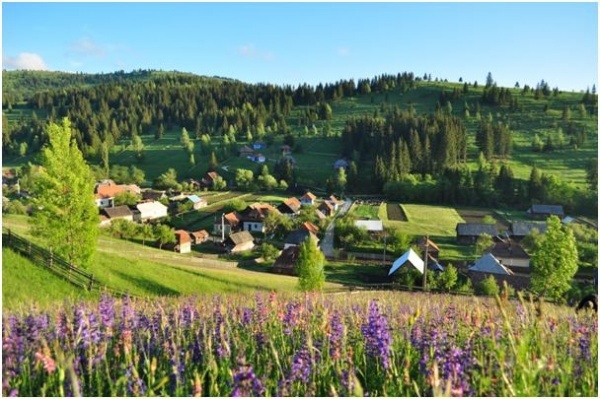 In this paper we make an attempt to identify the characteristic natural features of two neighbouring, but geographically, ecologically and culturally distinct areas of the Eastern Carpathians. The Csík Basin is one of the large tectonic mountain basins of the Eastern Carpathians and the Csík Mountains are part of the Carpathian flysch. The most characteristic habitats of the basin are fens and other types of wetland habitats. The fens host a large number of boreal and glacial relic plant species and represent the southern limit of the global distribution of some plant and butterfly species. The other wetland habitats are important for specialized invertebrates, fish, amphibians and birds. Most wetlands, especially the main river and its floodplain were heavily degraded in the past five decades. The characteristic features of the mountains are the secondary grasslands that were created by and for traditional agriculture in the past two to three centuries. 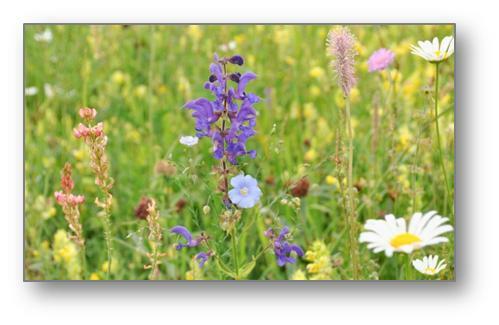 Especially the higher altitude hay meadows have an outstanding plant species richness. We argue that although several habitat types have been severely degraded, significant parts of the area are still in a good ecological condition, having many natural features that are typical. We recommend the usage of these features by rural developers in shaping local identity for a more aware usage of natural resources and better integration of local society in the ecosystem. Within a hay meadow research and conservation programme in the Eastern Carpathians of Romania, we conducted a sociological survey between January and March 2010 on the two demonstration sites of the project, Delne and Hidegség. • the biggest challenge that farmers face is selling products. If no viable solutions are found in this issue, traditional agriculture will continue to decline. We describe an integrated programme to improve rural incomes, support traditional agriculture, understand the ecology and biology of mountain hay meadows, and identify and protect key species and habitats in need of conservation. We mapped 34.2 km2 of hay meadows, of which 11.85% (4.05 km2) have been mown in 2011. Szépvíz commune has the largest amount of mountain hay meadows, and largest amount of mown mountain meadows; Pálfalva commune has the smallest amount of mown meadows (about 1% of the meadows) while in Felsőlok the amount of mown meadows is 0.5% larger than that of the unmown meadows. Szépvíz and Pálfalva communes have the largest amount of unmown meadows. As a general pattern, it can be observed that mowing is restricted to places with easier access – along main roads and valley bottoms. The main area of mowing is the surroundings of the Gyimes Pass, a contact zone between the Csík and Gyimes areas, with different land use patterns. Measuring ecosystem services is becoming a useful tool for people to understand the value of nature and also of HNV farmland. 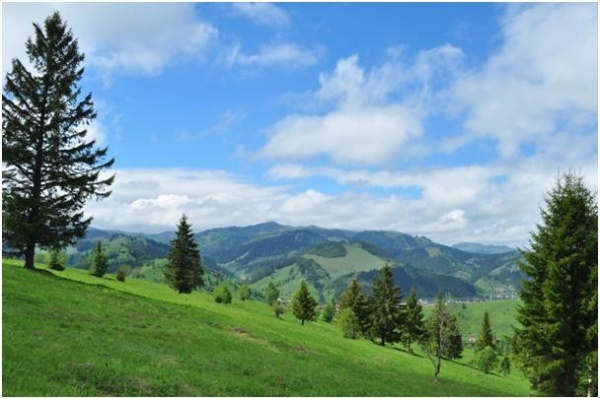 In this study we analyze several ecosystem services provided by grasslands in the Csík Mountains, Eastern Carpathians, like animal fodder, medicinal substances, pollination, nitrogen fixation and nature conservation. The analysis is based on data collected in the field about plant species composition and abundance (cover) and ecological indices available in the literature. Mountain hay meadows have the highest frequency of several provisioning services like health and well-being, honey- and pollen provision and other genetic resources (toxic plants) in our study system. Mowing has also generated exceptionally high species diversity in our study area and elsewhere in Eastern Europe. Because most provisioning services were positively correlated with species richness, it results that the wider variety of species that provide different ecosystem services in mowed meadows is a direct consequence of these meadows higher plant diversity. Our data represent strong evidence that low intensity mowing which may include short-term abandonment episodes coupled with the traditional seasonal light grazing (in autumn) is the best practice to produce and maintain a high variety of ecosystem services. There are very few published data about the butterfly diversity of the Csík mountains. The goal of our study was to quantify diversity and to relate it do main land use types, i.e. meadows and pastures. Currently, pastures and meadows benefit from the same amount of agri-environment payments, but their ecological value is not properly assessed. Our data suggest that there is a strong difference between meadows and pastures in terms of butterfly diversity, and that meadows have higher value for butterfly diversity than pastures. Agri-environment schemes should be designed to reflect this difference. The present scheme clearly favors pastures. On the long term, conversion of meadows to pastures is a threat to butterfly diversity in our study area. We recommend different levels of payment for meadows and pastures and / or strict rules on stocking density on pastures. The present study assesses the effect of two land use types: grazing and mowing, respectively abandonment on plant diversity. The results show important species loss following abandonment. Severity of impact depends on the vegetation type, being higher in vegetation dominated by Tor-grass (Brachypodium pinnatum). Clear differences in plant diversity patterns were revealed between hay meadows and pastures, hay meadows being richer and more evenly structured. Moreover, high altitude hay meadows are more diverse than the low altitude meadows. It is noteworthy that other abiotic conditions (moisture, slope, heat load) are additional modulators of floristic diversity in this area. In the light of our results, maintenance of traditional land-use practices is likely the most effective tool of biodiversity conservation in the area. Therefore, we recommend a separation of hay meadows and pastures in the agricultural policies on the basis of plant diversity patterns, as an ecological output of land management, i.e. higher payments for hay meadows. Otherwise there is a risk of conversion from hay meadows to pastures. On the other hand, the problem of abandonment should be specifically addressed by agri-environment policies. The logic of payments should be not so much compensation for loss, but prevention of abandonment.